Tired of Stanford’s limited dining options? For a refreshing break from stressful classes and summer jobs, consider indulging in some quality sushi at these Palo Alto restaurants. Aside from its claim to fame as Steve Jobs’ favorite restaurant, Jin Sho is a moderately priced gem known for its yellowtail jalapeno sashimi and spicy tuna rolls. This California Avenue favorite offers generally fast service and reliably good miso black cod. Make sure to call ahead for a reservation, as it is normally packed on weekends. The warm atmosphere, private seating options and large portions of quality food are what keep me coming back to Fuki Sushi despite the high prices. The sukiyaki to share is especially good. This local secret is well worth the wait — but definitely call at least an hour ahead of time for take out. Brown rice sushi is hard to come by, but this healthy option is a refreshing change of texture and taste. The décor is minimal, letting the high caliber food shine as the main attraction. 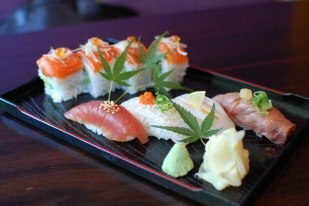 The fantastic proximity to campus and reasonable pricing make Sushi House a popular choice for many Stanford students. Nestled in Town & Country Village, Sushi House has surprisingly high-quality rolls and udon soups, not to mention fast preparation time for those who want to order for take out. The selling point of Cardinal Sushi is an easy-to-use website for placing your order and delivery right to your door. Although there are better options on El Camino Real, there is something to be said for eating in your pajamas.